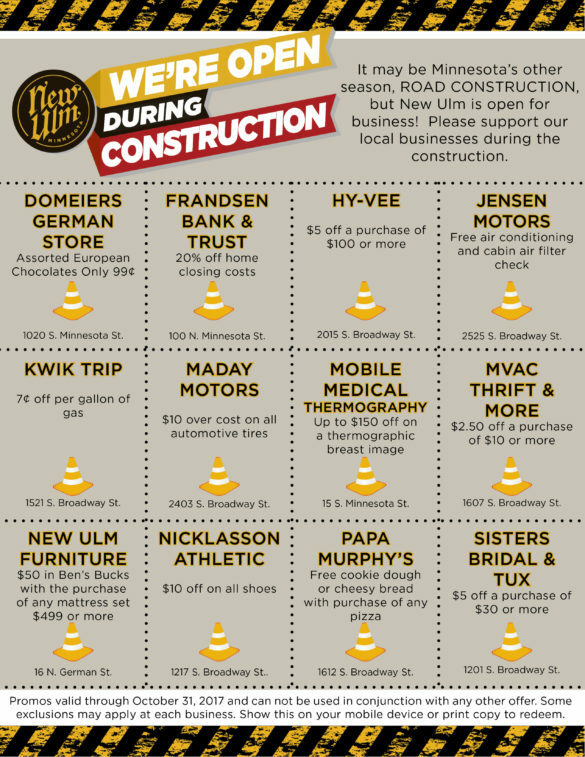 It may be Minnesota’s other season, ROAD CONSTRUCTION, but New Ulm is open for business! To support our local businesses affected by this summer’s road construction, the Chamber of Commerce has created a Coupon Page filled with great offers. Coupons can be redeemed by presenting them on your cell phone, or printed copies may be requested at the Chamber office or any of the participating businesses. All offers are valid until October 31. Check out these deals and save big! Thank you for supporting our local businesses during construction. Click here to view the latest updates about New Ulm’s road construction. Local businesses owners – would you like to add a construction coupon to this? It’s not too late! Contact us at cara@newulm.com or 233-4308.